Advances in cell therapy have resulted in significant progress toward treating some widespread and difficult diseases, many of which represent unmet medical needs. For example, phase 3 clinical trials are already under way for therapies based on mesenchymal stem cells (MSCs), including therapies for graft-versus-host disease, acute myocardial ischemia, and chronic obstructive pulmonary disease (COPD) (1–3). Successful cell therapy treatments for such afflictions will be not only significant medical breakthroughs, but also in very high demand. However, their commercialization is currently limited by high cost of goods (CoGs) and manufacturers’ inability to scale up manufacturing while maintaining their products’ critical quality attributes. The objective is to develop and integrate manufacturing approaches that will address those gaps. 1 Weng JY, et al. Mesenchymal Stem Cell As Salvage Treatment for Refractory Chronic GVHD. Bone Marrow Transplant 45(12) 2010: 1732–1740. 2 Lee JW, et al. A Randomized, Open-Label, Multicenter Trial for the Safety and Efficacy of Adult Mesenchymal Stem Cells After Acute Myocardial Infarction. J. Korean Med. Sci. 29(1) 2014: 23–31. 3 Weiss DJ, et al. 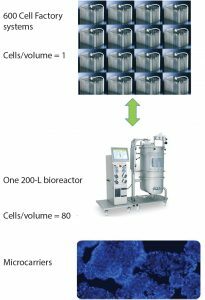 A Placebo-Controlled, Randomized Trial of Mesenchymal Stem Cells in COPD. Chest 143(6) 2013: 1590–1598; doi: 10.1378/chest.12-2094. 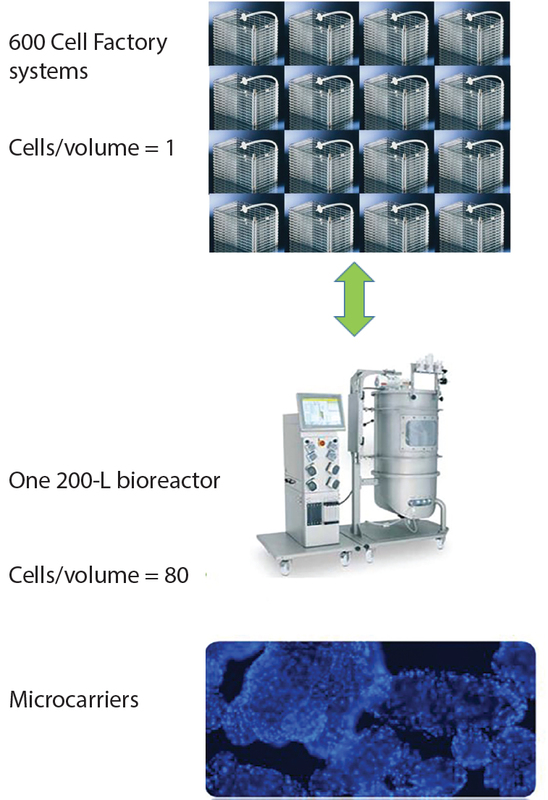 4 Microcarrier Cell Culture: Principles and Methods. GE Healthcare Life Sciences: Little Chalfont, UK, 2005. Erika McAfee is a scientist, and Sunghoon Jung is a senior scientist, research and technologies, and Eytan Abraham is director of emerging technologies, all at Lonza, Inc., 8830 Biggs Ford Road, Walkersville, MD 21793.